Budapest’s most recognizable building (and Hungary’s largest), sits majestically along the east bank of the Danube. The Hungarian Parliament building is unmissable during a trip to Budapest– its buttresses, towers and mighty dome are dazzling from near and far. It is especially impressive at night, brightly illuminated in a golden glow. The marble-clad interior is just as striking. Sweeping staircases and intricate ceiling designs are all accented with a large amount of gold- 40 kilograms! In fact, the Parliament building was so expensive, the money used to build it would have been enough to construct a small city! Here are some pictures I took from inside the Hungarian Parliament Building during our tour. Cigar holders in the hallway. Construction began in 1885, taking 1,000 workers 17 years to build the Parliament. It was scheduled to be finished by 1896 to celebrate the 1,000th anniversary of Hungary’s foundation, but was not completed in time. The inspiration for its neo-Gothic design was London’s Houses of Parliament. The building is 268 m long and 123 m wide. The dome is 96 m high. There are 691 rooms and 29 staircases. 40 million bricks were used in its construction. Nearly 40 kg of 22-23 karat gold was used for decorations. Just 23 years after completion, renovations had to begin because the stone chosen by the architect was too soft. Tours: Guided tours are held in English, Hungarian, French, German, Italian, Spanish, Hebrew, and Russian. Specific times are allotted for each language. A tour takes approximately 45 minutes, including the security check. It’s worth noting that there are no restrooms or bathrooms available to visitors during the tour. Taking pictures in the Dome Hall is strictly forbidden. Closing Days: There are no guided tours on national/bank holidays (March 15, August 20, October 23). The Parliament building is also closed January 1, Easter Sunday and Monday, May 1, November 1, and December 24-26. Buying Tickets: Same-day tickets can be purchased in limited numbers at the ticket office in the Visitor Center. The ticket office is open from 8:00 am-6:00 pm (April 1- October 31) and 8:00 am-4:00 pm (November 1- March 31). Be prepared for a long lineup. 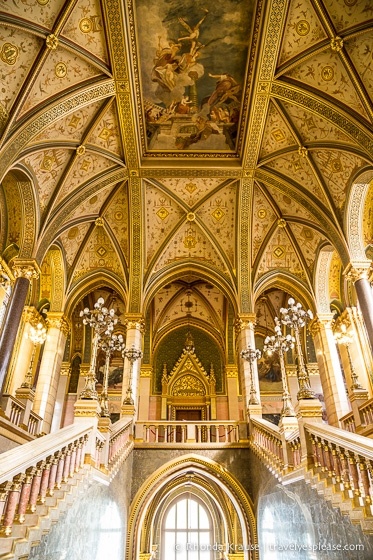 More conveniently, you can buy your Hungarian Parliament Tour ticket in advance here. Information was correct at the time of publishing but can change without notice. Please confirm costs and times directly with service providers.